Hiya guys! I hope everyone is having a good week with not too much going on. Not me though, I have so much to share that your wallets are going to hate me. Your nails though, your nails will love me long time. Okay, enough of me being a weirdo! 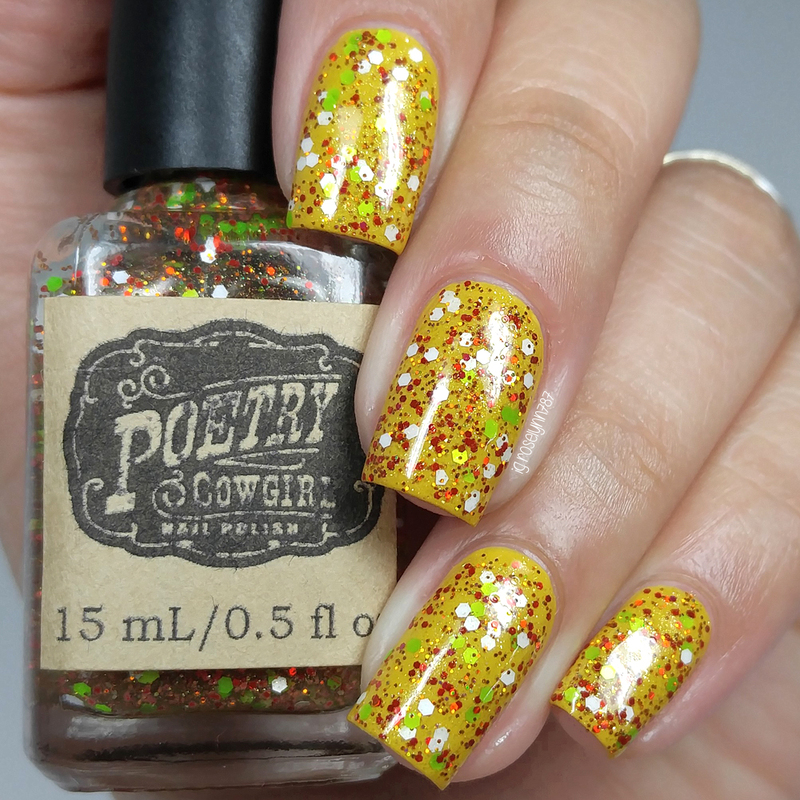 Today I'm sharing swatches for the Bake Off Box, which features Poetry Cowgirl Nail Polish, Sassy Pants Polish, and Daily Hues Lacquer. This fun and cute trio is inspired by fall desserts! The Bake-Off Box will be available for purchase on Friday, September 16th at 3PM EST thru poetrycowgirlnailpolish.com. Each box contains three full-size 15ML polishes for $25.00 plus shipping. Vanilla Cider Panna Cotta can be described as a rich golden shimmer polish packed with gold micro-flakies. Isn't this gorgeous?! I am so in love with the one of this shade. It's not often a gold shimmer suits my skin-tone this well. The formula has a bit of a thick consistency, but it's the kind you want to have in a polish. The application is super manageable and smooth, layers without an issue. Shown here in two coats and sealed with a glossy topcoat. 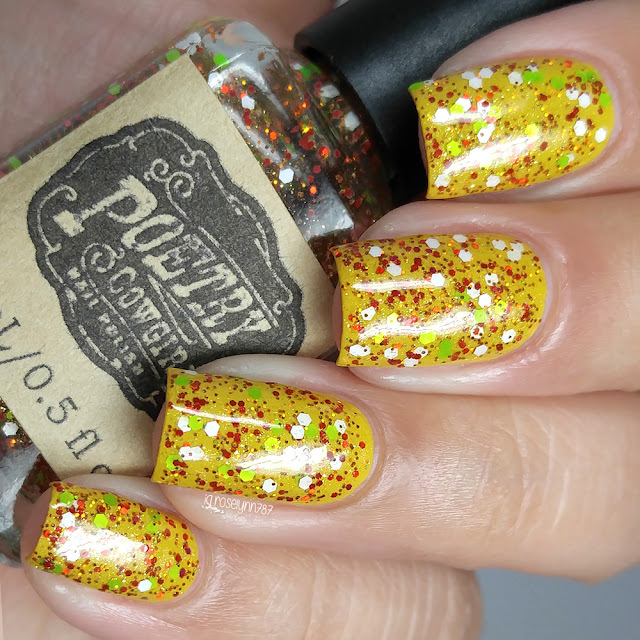 Spiced Apple Pie can be described as a spicy glitter topper packed with bright green, white, holo red, and holo copper glitters, and a hint of gold shimmer. I'll admit I wasn't too sure how I was going to feel about this one... until I put it on. Definitely a very Fall/Festive combination, especially if you layer it over dark tones. I personally love how it looks against this dark mustard kind of yellow. Formula was really smooth and had a good consistency for layering. There was no dabbing or fishing for glitters needed. Shown here in two coats over a yellow base and sealed with a glossy topcoat. Cranberry Streusel Cake can be described as a decadent berry colored crelly loaded with caramel, bronze, pink, yellow, and peach glitters. The color to glitter combination just screams cutesy! The formula applies sheer, but it builds up nicely to an opaque finish. Glitter overload! Each brush stroke has ample glitters with great distribution. Since this is heavy glitter polish it does dry to a gritty finish, but can be smoothed out with a single layer of topcoat. Shown here in two coats and sealed with a glossy topcoat. Overall I really love how cutesy this trio turned out! Especially because each one of the polishes vary so much from each other. These are some of my favorite makers as well so seeing them united in a box is always a treat. Definitely a must-have box for the season! But tell me what you guys think, which one is your favorite? To recap, the Bake-Off Box will be available for purchase on Friday, September 16th at 3PM EST thru poetrycowgirlnailpolish.com. Each box contains three full-size 15ML polishes for $25.00 plus shipping. As always, be sure to follow all the makers on social media for their latest releases and sales. Beautiful swatches of these! You did an amazing job on them! You always 'nail' the swatches! I'm not sure about this box yet. There's a lot of yellow in it, which gives me lobster hands. The theme of these is too cute! This is such a cute idea for a box!! Cute name! And cute colors! I reeeeeeeeeally love that glitter topper!! Zoya Nail Polish Exchange - Happening Now!